Wireless security systems are part of the new wave of security technology. There are a lot of options in the market that you can choose and one popular option are those made by Swann. With wireless systems, you can have all of the security that you could want without the wires or the potential of someone trying to cut the wires and shutting down your system. If you are in the market for a new wireless security system, these are five top options that you can find in the Swann wireless security system suite. Everyone wants to feel safe in their own home and the best way to do that is a security system. A system like this will help to keep you safe even when you aren’t watching because it will always be watching. If you have ever wanted a bit more protection in your own home, a security system is the best way to go. 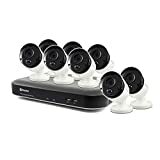 Swann 8 Channel Security System: 1080p Full HD DVR-4575 with 1TB HDD & 8 x 1080p Thermal Sensing Cameras PRO-1080MSB – This is a set of 8 cameras that feature night vision. It is also weatherproof so you can have these outside in the elements. Because there are 8 cameras, it is enough for a smaller home but you could easily purchase more cameras for a bigger home and have them surrounding the home. One of the benefits of this package is that it will work with Google Assistant so you can hook it up to your existing technology. Swann Smart Security Camera Bundle: 1080p Full HD Wireless Security Camera with Solar Panel & Outdoor Mounting Stand – If you are into solar products, this is the one for you. With this bundle, you not only get a wireless security camera but you also get a solar panel to power it and an outdoor mounting stand to set it up. The camera even has night vision and the solar panel will keep it going during the day and at night for ultimate protection. 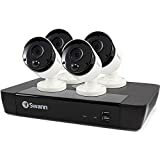 Swann Smart Security Camera: 1080p Full HD Wireless Security Camera with True Detect PIR Heat/Motion Sensor, Night Vision & Audio – Want a system that goes the extra mile? This camera not only have night vision like the others but it also has a heat and motion sensor to detect things that other cameras may miss. Outdoor Security Camera: 1080p Full HD Wi-Fi Camera with Audio, Night Vision, Local & Cloud Storage – Another great product to consider is this camera that actually will take into account any audio that is outside of the home. It will record any sounds and save everything, including the audio and video to the cloud so you can also see it and check on your home even if you are out of town. Indoor Security Camera: 1080p Full HD WiFi Camera with 2-Way Audio, Night Vision, Local & Cloud Storage – It is not only good to keep up with what is happening outside of the home but inside as well. This camera is designed to record anything happening inside your home so you can have eyes on everything, even your own pets or children when you are away. Paired with outdoor cameras, this is the perfect package to keep your home protected. Swann security systems are ones that you can count on and you have quite a few that you can choose from. If you are in the market for a new wireless security system, be sure to reach out to us here at Protect America. Paired with our home security monitoring, you can find the most peace and security you could imagine. We have some other great systems that you can get free with a security contract that are just as good as these options, if not better. Call us today to learn more and to get started with better home security.